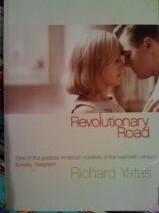 I read Revolutionary Road by Richard Yates while travelling between my work in the city and my suburban home by train. This reading time is often the highlight of my day, as at work I feel like a mouse running in an endless, pointless wheel, trying to earn enough money to keep us in the drudgery in our boring, ordinary life in our suburban home… or so I felt while I was immersed in Revolutionary Road. Luckily these feelings went away after I finished the book, otherwise I would probably have told my boss where to jam the job that I actually love, thrown the keys to our dearly loved home back to the bank and gone off footloose and fancy free to start a whole new life, somewhere initially exciting but ultimately unsatisfying, while I desperately missed my family and friends. Revolutionary Road is set in the 1950’s in the suburbs. Frank Wheeler, the main character, was a promising young man, all talk and no action, who impressed his friends so much during their late night, drunken conversations that based on their flattery he came to believe he could do anything or be anyone. At the height of his confidence, he met and fell in love with a first rate girl, April, who at the time was a not very successful actress. Frank and April married and had two children before moving to a dinky little house on Revolutionary Road, out in the suburbs. Frank and April’s think they are more interesting than their friends, much more interesting than their neighbours and that they the trapped in the mundane lives they are actually living. April never wanted to be a mother and is bored and lonely out in the suburbs. Frank took a nothing job in the nothing company his father worked at for his whole career, and does as little as possible while on the payroll. Frank is on the verge of starting an affair with a woman he works with. They fight almost constantly, blaming each other for their unhappiness. April convinces Frank that they should move to Paris where she will go out to work while he finds himself. Frank is also taken with the idea of escape and for a time they are happy together, making plans for the amazing new life they are going to have. Having a shared dream brings April and Frank closer than they have been in years and for a time they are happy. April is more serious about moving to Paris than Frank and she starts taking actual steps to make the move happen. Frank, almost by accident though, does some actual work for his company and he is offered a promotion. Frank has second thoughts about leaving and when April falls pregnant, Frank is secretly relieved that this will not allow them to move to Paris. April wants to terminate the pregnancy but Frank won’t allow her to, even though he doesn’t want another child either. Their relationship deteriorates again and to further complicate things, Frank’s affair with the woman he works with heats up. By now, you’ve probably realised that there is no way things are going to turn out well for Frank and April. This book is very, very well written. The character’s voices became real to me very quickly. The whole point of art, in this case writing a novel, is for the author to cause the reader to feel particular emotions, and Richard Yates certainly achieved this with Revolutionary Road. Frank and April had no gratitude for what they had, no satisfaction from doing things properly, no joy and very little love for their children. Apart from their shared fantasy of escaping their real lives, they took no pleasure in each other’s company. While I felt sorry for them, I was also glad to finish this book and leave their unhappiness behind, before they affected my joy in life. I will be watching the movie of Revolutionary Road sometime, which was directed by Sam Mendes and starred Leonardo DiCaprio, Kate Winslet and Kathy Bates. I don’t know if Richard Yates wrote anything else, but if he did I’ll be reading it.